Longfellow perhaps did not appreciate how persistent ‘knocking’ would become automated in the world of the silent telephone call marketing approach of today. These computerised diallers ring a householder’s number and are then designed to connect a member of staff in the call centre when the equipment registers that it has been answered by a person. However, if no operator is available no one answers, this causes silence at the other end of the line. Some play a message apologising for the call, others simply hang up. 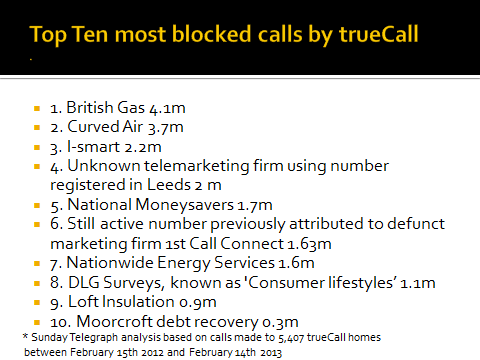 The growth of such marketing calls was reported by Jason Lewis, Investigations editor of the Telegraph a few days ago. 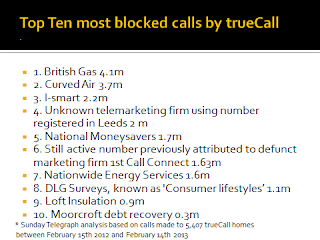 It is estimated following a survey commissioned by the Sunday Telegraph to 20,000 homes where a trueCall answering unit was fitted to record the number of incoming calls. The story was also reported in the Daily Mail and elsewhere. It made 7,000 cold calls to 900 homes over the course of a year, almost eight calls to each household that’s an average of over 7 calls to each home. Whilst the automated silent calling firms are proliferating it makes the business of prospecting of well intentioned salespeople all the more difficult. How soon do you give up? In summary 92% of all salespeople give up after No sales on the fourth call Yet 60 % of customers say 'No' four times before saying “Yes”! Come what may, professional selling is not about being a nuisance - rather it requires one to be polite , courteous but persistent. Alun Cairns, a Conservative MP has rased concern on this issue with particular reference tovulnerable receivers of such calls as the elderley.